Old Chester, PA: Transportation: Southern Pennsylvania Bus Co.
Cover of the "Dedication and Opening" program book for the new terminal at 13th & Edgmont Ave. 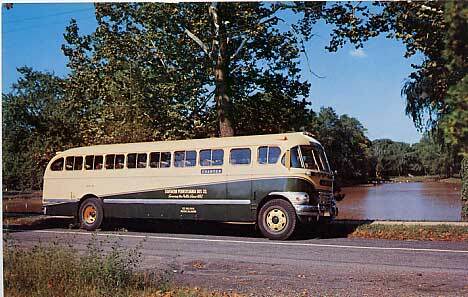 The Southern Pennsylvania Traction Company began operating buses in January 1925 to replace "jitneys". The buses had schedules between the Post Office (5th & Welsh St.) and Highland Avenue, and between the Post Office and the Worth Steel plant at the Delaware state line. The Southern Penn buses (dark green below with cream color around the windows and the top) continued to operate until the late 1950's or early 1960's. At that time they became a part of another company which was eventually taken over by Red Arrow and then became a part of SEPTA. "He drove for SPBC in the 1950's. His nickname was "Over the Road Joe" because he never turned down a chance to drive long distance trips. I remember that SPBC supplied the special touring bus for Bill Haley and the Comets." "Joseph Shields Jr of Eddystone; later to become Eddystone Police Chief; was a driver for Southern Penn at one time. He has many fond memories of driving." "I am not sure exactly what year my father started driving the buses, but I know he was driving the buses back in 1946 or 1947 because he met my mother around that time. She was his passenger. They were married in 1948, however they divorced much later(1965?). Of course he went on to Red Arrow and then to Septa. He drove the buses for about 37 years until his retirement. His name was Alfred J. Tinley. He had dark hair and wore glasses. He only went to fourth grade, but he was very smart. On one of his bus runs, he was held up by two men who held a double barrel shotgun to his head. He gave them the box of money (they used to keep it under the drivers seat). He told the men to please not shoot him because he had a family. That is, I believe, the reason they started the correct change concept. My father was a very honest person. One time he found a paper bag full of money (no name on it) in the back of the bus and turned it in. It ended up belonging to KYs bakery. They never even thanked him for that. He often wondered why. He really loved driving the buses. He passed away on Dec. 6, 1995. Six (6) more days he would have turned 80 years old." 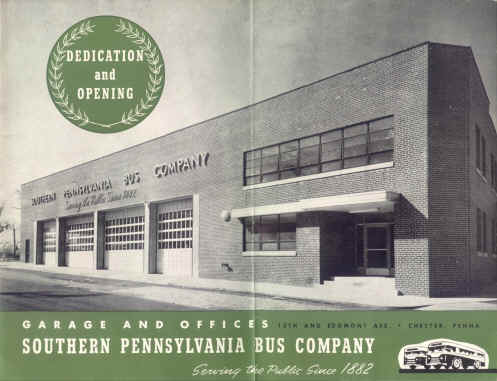 Recollections: "My father, Walter F. Donnelly, started work with Southern Penn back in the 1930's as a bus driver, went on to be the Chief Dispatcher, and then Office Manger, when Southern Penn had to relocate after the fire. He finally retired in the late 1970's. I know of two other drivers who were good friends of my father during that time, their names were Abe Guyer (from Brookhaven) and James Baker (from Garden City). I can remember my mother taking my father's lunch up to the bus stop at Pennsylvania and New Jersey Avenues in Garden City when he made one of his frequent stops there. I can also remember stopping into the "Bus Barn" when we were in Chester for a soda with my father and the other drivers that were there." "The fire was more likely in 1947. The picture is of the rebuilt barn, we used to call it the car barn because they had trolleys before busses. the last tracks that I remember were the passing section between 18th & 20th sts.. on Edgemont Ave. The wind wasn't that bad that night and was blowing toward 13th st. as the old busses were in the side yard on 14th and they were not destroyed nor as I said before the section behind our house on Crosby st. I now remember standing on 14th St. watching. The flames were fairly high and when the gas tanks starting going they chased us away. I did stay home from school the next day and toured the ruins before they put up barricades. I got chased that day too. "In winter time when it snowed we used to hop the busses on our sleds, the new busses were harder to find a hold than the old ones so we mostly took the Upland route." "Apparently the fire could have been in 1946. I am sure I was in school (at least kindergarten) since I distinctly remember having been told by the "teacher" that I could have stayed home the day after the fire. "The fire must have been something since my dad worked at Sun Shipbuilding & Drydock and tried to get home but could not make it through the police and fire lines. They sent him back to work. "The morning after the fire I distinctly remember my dad coming home and stating "Some family I have, the barn burns down and my family sleeps through it." I remember then we all ran to the front windows, looked out and WOW - nothing but rubbish where the barn used to stand. "I understand that our house had been contantly watered down and the firemen were ready to come in and rescue us if we caught on fire. (Wind must have been blowing the other direction since everyone for blocks around us were up and out of their houses.)" "... I lived behind the bus barn in Chester and my Dad was a driver for them until he retired in 1972 and died shortly after that. I lived on Crosby St. 13th street. ... I don't remember allot but we played allot of Whikey Stick in the driveway to the repair shop for Southern Penn Company. I played for years there and had Aunts that live on Esrey Street also that does not even exsists anymore"
1 - Bill Crystle, date from Chester Times newspaper clipping. � 2000, 2001, 2002, 2003, 2005 John A. Bullock III.